Goldenboy (Feat. Members of Elliot Smith, Eels, The Rentals) - Since the release of his band’s 2003 debut Blue Swan Orchestra – a KCRW favorite that featured guest vocals by Elliott Smith on “Summertime” – Shon Sullivan’s Goldenboy has trekked near forever on the road, supporting the likes of Bright Eyes, Neil Finn, Stephen Malkmus and Grandaddy. For most of these shows, he was doing double-duty as well, playing multiple instruments with Finn, the Rentals, Eels and others on tours across the globe. 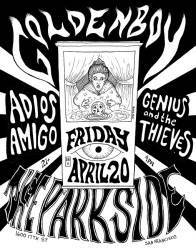 Adios Amigo is the solo project of Johnny Major (drummer for il gato). Current members include Johnny Major (guitar, vocals), Jason Forrest (guitar, vocals), Shawn McNamara (bass, vocals), and Steve Wills (drums, vocals). The genre can be described as indie-rock-pop. Influences and parallels include Broken Social Scene, Elliott Smith, Phoenix, The Shins, and The Strokes. All members of Adios Amigo reside in San Francisco, CA. 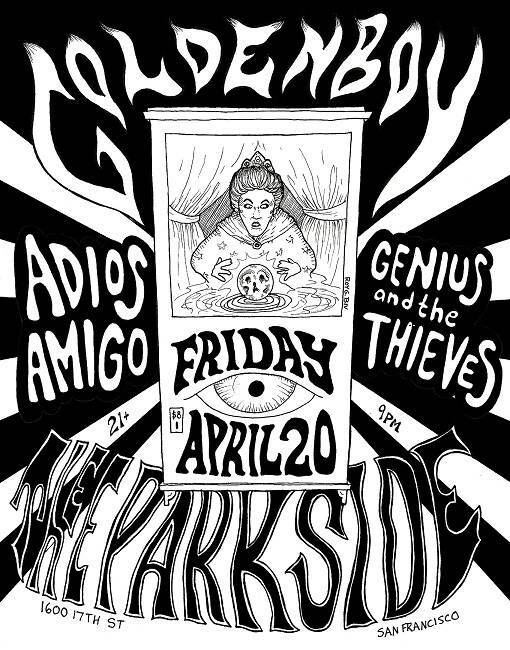 Genius and the Thieves - Raised on a steady diet of classic rock and punk, Genius and the Thieves are five guys who spend their days writing celebratory, rowdy, rock and roll with a distinct blues edge and a dash of indie sensibility thrown in for good measure.